QUETTA: Nargis Ali Changazi, a young student belonging to the Hazara community in Quetta, Balochistan, has given up on her dream of becoming a journalist someday. One fateful day in June 2013, she was walking towards the parked bus outside the university when a huge explosion occurred. The explosion was so intense that she collapsed. “When I came around, I found myself at the hospital,” she said. The June 15, 2013, bombing of a bus carrying Hazara students of the Sardar Bahadur Khan Women’s University in Quetta killed 14, injuring 19 others. It was part of a series of bombings that day, carried out by the banned sectarian outfit Lashkar-e-Jhangvi that has led sustained violence against the Shia Hazara community in Quetta, killing thousands of people. At the time, Nargis was a student of journalism at Sardar Bahadur Khan Women University. She and afriend, both class fellows at the time, decided to give up education following the deadly attack. She says the bombing placed fear so deep in her heart that it would perhaps last a lifetime. That year, said Nargis, a large number of girls, all Hazara, quit their education in the middle of their study term: “It was the blast, but also the behavior of university administration who treated us as a threat to their safety”, she said. Soon after the blast, the media reported that the attack on the university was not a sectarian attack. However, the investigation later led to the conclusion that the Hazara girl students were the prime target of the bombing, even though many others died in the blast. The bombing was only the beginning of a long ordeal for the students. After the blast, the women of Hazara community were considered a security risk to travel with. “The university administration decided that the bus service will not pick up more than five female students of the Hazara community”, said Nargis. Spokesperson of Sardar Bahadur Khan Women’s University, Zameer Kurd told News Lens Pakistan that there were around 25 percent students from Hazara community before the attack. “Later, we saw huge decline of admission by Hazara girls but now situation has improved. They are nearly 20 percent at the moment.” He said that another problem Hazara students face is transportation. Asma Mohammad Mohsin, another former student of the university belonging to the Hazara community, said the university administration refused to give them transportation. She said the situation was still same in Quetta: the drivers and the students were afraid to travel with Hazara women. An administration official at the university told New Lens on condition of anonymity that the university had changed the bus routes and only five Hazara girls were allowed in each bus because of security reasons. 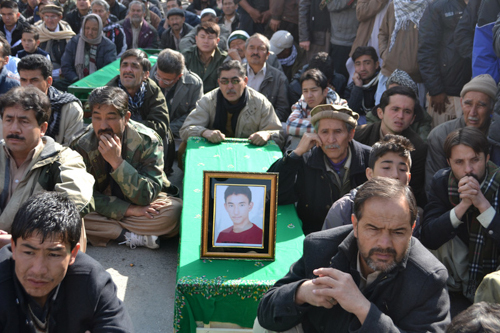 The Hazara community in Quetta is one of the worst victims of deadly sectarian attacks in Pakistan, with a long history of sectarian violence that began in the 1980s as a consequence of proxy war between Saudi Arabia and Iran during the Afghan Jihad years. Though there are only two neighborhoods of Hazaras in Quetta, , its members can be easily identified by their distinct Mongolian facial features. While attacks on the Hazara community have continued over the years, they have become more aggressive since 2001. The year 2013 when the bus from the university was bombed was the bloodiest. On January 10, 2013, twin explosions at a snooker club at Alamdar Road, a Hazara neighbourhood, killed at least 115 people, injuring more than 270. A month later, on February 16, a bomb blast at Hazara Town in Quetta killed 73 and wounded at least 180 people from the Hazara community. Raza Mohammed Wakeel, leader of the Hazara Democratic Party (HDP), told News Lens it would be better if the government took action against the terrorists rather than asking women and men of Hazara community to restrict their movement and follow security plans.